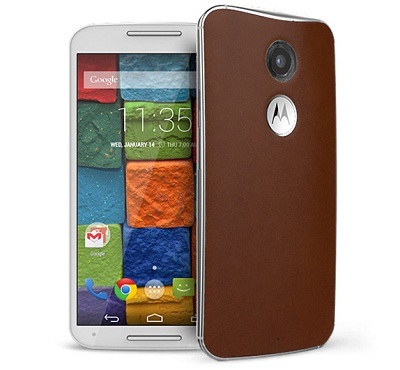 Motorola unveiled the launch of the Moto X successor called new Moto X early this month at an event in US. Soon after the event, the vendor hosted one in India to announce the handset in the country alongside the new Moto G and the Android Wear based Moto 360 smartwatch. At this event, Motorola released the Moto G sequel in India for a price tag of Rs 12,999, but the other devices did not make their way into the country immediately. Now, the new Moto X has been released in the country starting from a price of Rs 31,999 for the normal model. The customized leather and wooden back models are priced at Rs 33,999. Like the other Motorola smartphones launched lately, this one will also be made available exclusively via the e-commerce giant Flipkart from today midnight. Detailing on the technical specifications, the new Moto X is fitted with a 5.2 inch FHD AMOLED display that carries a FHD screen resolution of 1920×1080 pixels translating to a pixel density of 423 pixels per inch.This screen is topped with a scratch resistant Corning Gorilla Glass 3 protection. The raw hardware aspects of the device include a quad-core Qualcomm Snapdragon 801 processor ticking at 2.5 GHz clock speed. This processor is aided by Adreno 330 graphics unit and 2 GB of RAM that will take charge of the graphic and multi-tasking departments. The new Moto X is fueled by Android 4.4.4 KitKat operating system and it is claimed to receive the Android L update soon after its commercial release. The imaging necessities of the users are taken care of by a 13 MP main camera with dual LED flash and a 2 MP front-facer with FHD 1080p video recording ability. The new Moto X comes in two variants – one with 16 GB and the other with 32 GB of internal storage capacities that cannot be expanded externally. Other aspects of the handset include 3G, Wi-Fi, Bluetooth 4.0, GPS and NFC for seamless connectivity and a 2,300 mAh battery.